About Apel Machine & Supply Company. We are always working to to stay current with the constant changes in this global market. Apel Machine & Supply Company was founded March 1, 1941, when Fritz, Edward and Arthur Apelpurchased Cullman Iron Works from JakeEhrensperger. Jake’s father, Henry, had come from Depere, Wisconsin, in 1897 and started the business in an old box factory at 1st Avenue East between 8th and 9th Streets, SE. Fritz, at age 16, started working in the foundry for the Ehrensperger family. The foundry business, however, did not last long after World War II. Business changed to work on steam engines, cotton mills, sawmills, sharpening of plows, saws, and farm related equipment. Edward went to Cleveland to Lincoln Electric School and learned electric welding for truck frames, etc. Eventually, the Apel family drilled water wells, plumbed chicken houses, ran water lines and handled mill supplies such as screw conveyors in order to keep up with the times and changing economy. Then came the steel business; furnishing structural steel for houses and buildings, steel erection and crane service. As the business expanded, it moved to Highway 31 North in 1959 where it remained for the next 42 years. In 2001, a larger and more modern building was constructed at the present location. In the last couple of years, Apel Machine & Supply Co., Inc has moved and expanded to our 3rd building. 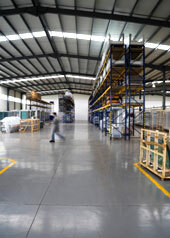 We now have over 50,000 sq. feet for warehouse space, fabrication, and sales. Our building sits on a large acreage of land that allows us the room for many more expansions to accommodate our diverse range of services and customers. We are always working to find new equipment and techniques in fabrication and erection to stay current with the constant changes in this global market. We try to anticipate our customer’s needs to fully serve our community. To keep up with these changes we are adding new machines, people, and processes. This helps us to stay competitive and try to be a leader in quality and customer satisfaction.